This is the third in a series of posts about the American Civil Liberties Union of Georgia Records, which were processed in 2015 and are now open for research. These records document the ACLU of Georgia's litigation, lobbying, and public education efforts to protect civil liberties for all Georgians. Their work, which began in 1963, involves issues such as freedom of speech and assembly, freedom of the press, freedom of religion, due process of law, and opposing discrimination against many groups. This series of posts was written by Shaniqua Singleton, a student at the UGA School of Law, who was instrumental in processing these papers. Series II, Box 40, Folder 8. In what has turned out to be an eventful and important election year, members of the general electorate have just cast their votes for America’s next president. On the face of it, the process of voting seems simple enough: an individual registers to vote, identifies a polling place, and casts a ballot, fulfilling what many view as a crucial civic duty. However, this simplistic description glosses over a long and continuing discussion about voting rights in the United States. The ACLU of Georgia frequently has been at the forefront of this discussion. Series I, Box 8, Folder 51. Over the years, the ACLU of Georgia has worked to protect and secure the voting rights of all segments of the population. The organization believes in the importance of the democratic process and seeks to promote voting regulations that incentivize as many people to vote as possible. 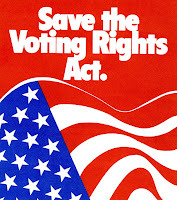 The ACLU monitors electoral processes throughout the state to ensure the rights of voters are protected and litigates matters related to voting rights when needed, such as challenging the compliance of judicial elections with the Voting Rights Act or challenging redistricting plans for racial discrimination. Additionally, the ACLU engages in a number of voter education campaigns and actively works to reform laws allowing felon disenfranchisement. ID to vote, 2005. Series IV, Box 7, Folder 36. 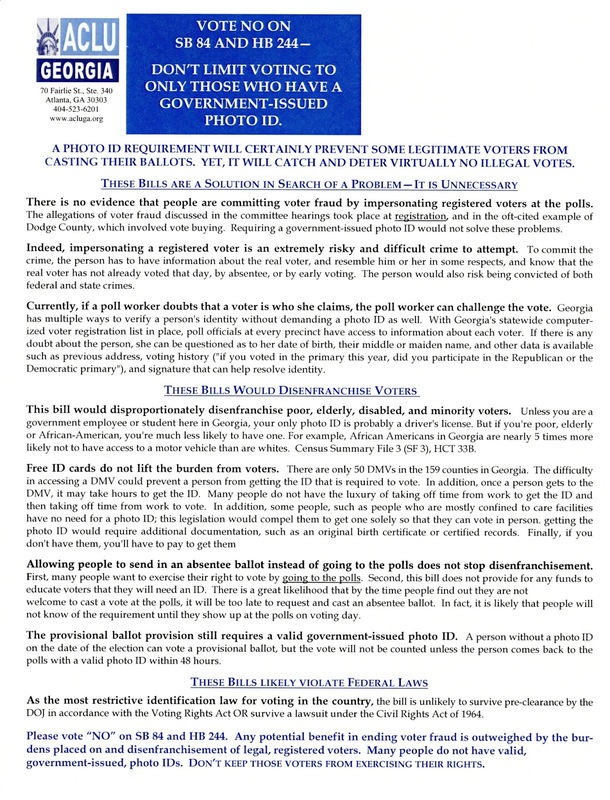 A key example of the ACLU of Georgia’s work in this area is its effort to challenge voter identification requirements. The records of the ACLU of Georgia highlight one such case. In Common Cause v. Billups (2005-2009), the ACLU challenged the Georgia General Assembly’s revision of the state’s voter identification laws. The new law limited the number of permissible forms of identification to 5, a significant reduction from the 17 different forms of identification previously allowed, and required individuals to pay for voter identification cards. The ACLU ultimately lost on this matter, but researchers interested in viewing these records will find many documents, including arguments filed with the courts, court orders, and debates among amicus curiae (“friends of the court”), illustrating the nuances of voting rights and the efforts of the ACLU to protect these rights. There are also materials in Series IV. Legislation related to photo ID requirements. Researchers might especially be interested in these records, since the arguments set forth by the ACLU echo much of the dialogue regarding voter turnout and participation heard in this election season.